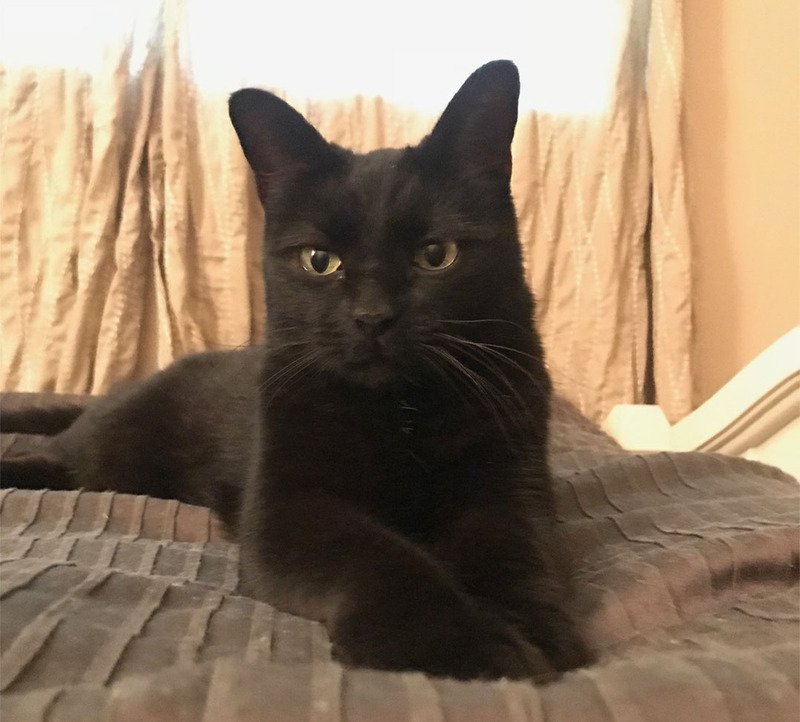 For Lorinda Roberts and her son, Jon Gulla, a black cat is a sign of good luck. Julie, a feline whom Gulla rescued with her brother, Jack, went missing in early 2012 after exiting Roberts’ Carmel home. Gulla was away at college at the time, and Roberts felt awful about it. She kept searching for Julie, but it wasn’t long before Gulla was diagnosed with lymphoma and the hunt became less of a priority. Still, she never gave up hope that the cat would be found, even though she knew the chances were slim. So when Roberts saw a post on PawBoost Lost & Found Pets earlier this month featuring a small, declawed, older adult black cat found near the area Julie went missing, she decided to see if it might be her. She wasn’t feeling too hopeful when Gulla went to see the cat, a skittish stray that was hiding under the shed of a family that had been feeding her. But then everything changed. Christine McKeon, a neighbor of the family who had been feeding the cat, had originally posted about the missing feline online. She couldn’t believe that her owners had been found – six years after the cat went missing. Julie is sequestered at Gulla’s home until her veterinarian clears her to be reintroduced to Jack. Much has changed since Julie went missing in 2012. Gulla recovered from lymphoma, got married and landed a job in transportation. But even after all that time, Julie looks much the same. Delighted this poor little stray found her way back to her beloved home; most cats that get lost, will venture back to their home; since they are highly intelligent and sometimes need help from their owners too. Losing your cat must have been devastating but most likely you probably forgot food may have been the catch all of her return; she wandered when hunger set in searching to fulfill the need; Its so important because they can lose their way at times but when in search of food, and had it been at your door, she may have found her way back sooner; I’m so happy you are well; 6 years, a very long time to be a stray. And the biggest of thank you to the amazing people who took care of Julie throughout all the suffering years on the streets; Julie was so very fortunate to have found loving people who cared about a little black stray. Oh my, and to be declawed and lost; no defense. Thank goodness someone was kind enough to advertise about this little lost soul; I would have been hanging posters for the rest of my life; thank goodness there are still some wonderful loving individuals looking out for the lost, forgotten ones. A neighbor of mine lost his house cat; never put food near his door so she could find the proper home smell she needed to find her way back; he didn’t care; she never came back. I looked and looked; I hope someone like the sweet people who care for Julie, is looking after my neighbors cat; God Bless the animals and all who care for them. Love ya Julie. Distressing to read that Julie had been declawed. Not only is it a horrible thing to do to cats for so many reasons, and should be an outlawed practice under the heading of animal abuse, it makes cats completely defenseless “out there”. Also, I wonder if Julie understands that she is “owned”. Doubt it. I cringe every time I come across that language in relation to pets, and generally speaking, certain that the concept contributes to animal abuse.